Born in Gibraltar and raised on a yacht around the coasts of the Atlantic, I’m an author, martial artist, and introvert. In between the necessary making of money to allow the writing of more books, I can usually be found stowing away on a spaceship, halfway to the further galaxy. Science-fiction and urban fantasy are my favourite genres to write in. I grew up on a rich diet of Anne McCaffrey, Tolkien, Dorothy Dunnett, and Jack Higgins, and finally started to write my own books aged fourteen. I can't point the finger at any one book or author that set me in my current direction, but I blame my tendency to write characters who favour drastically practical solutions on some mix of those. If I can toss in a bit of gender- and genre-bending, so much the better. Status quo is boring. I hope you enjoy reading the books half as much as I enjoyed writing them! Death is for the Living is an urban/action and adventure fantasy novel written by J.C. Steel. Cristina Batista and her partner, Jean Vignaud, had previously hunted vampires on their own, their sleek ship able to cruise unobserved, for the most part, into just about any of the Caribbean ports of call the vampire hunters called home. They were now part of a group with two other hunter-teams sharing a larger yacht. It was a relatively uneasy change in circumstances. Jean had serious misgivings about the situation, especially when Cristina was paired off with Sean, the younger and less experienced hunter, whose recklessness seemed an unfair burden on her. On their last foray, Sean and Cristina had found a vampire staked out for execution by the sunrise. Their spur of the moment decision to bring him aboard unleashed all manner of condemnation upon them. Why had he been staked, and what purpose did they have for rescuing one of their sworn targets? How would they keep this vastly more powerful being under control or should they simply kill it? That act of mercy was to prove a catalyst that brought the simmering undercurrents of the Artemis to a head. J.C. Steel’s urban/action and adventure fantasy novel, Death is for the Living, has something for vampire and naval adventure fans alike. Happily, I find both genres to be enjoyable, and settled in for an exciting and enjoyable read. Steel’s book actually exceeded my expectations. The sailing and storms-at-sea scenes are superb, and the underlying historical vampire tale is top-drawer entertainment. Steel’s plot is ingenious and riveting, and his writing is flawless and flowing. His characters have depth, credible histories and staying power. Yes, pirates, vampires, vampire hunters and storms at sea can exist within the pages of one book -- and they do it so well in Death is for the Living. It’s most highly recommended. Death is for the Living by JC Steel is an epic vampire fantasy that takes the reader on a journey from the Caribbean all over the world, as Cristina Batista and her partner Jean are caught up in vampire machinations that reach the very pinnacle of vampire society. Cristina and Jean are part of a team of vampire hunters who roam the Caribbean on the yacht Artemis, looking for and destroying vampires as they go. Both of them, though, have pasts that are perhaps not compatible with the idea of vampire hunters. Christina was almost changed several years earlier, but somehow was able to stay human and Jean, indeed, was a vampire, changed several centuries ago, until a witch gave him the power to become human again. Both, for different reasons, have great motivation to kill the most powerful vampire in the New World, but their journey will be fraught with danger, fear, and an extreme sense that this might be the end of both of them. In Death is for the Living, we find a different type of vampire tale that helps to lift this book above ordinary vampire-hunting stories. Author JC Steel’s style is relaxed and readable, dropping little nuggets of information about the backstories of both Cristina and Jean as the reader progresses through the book. The conflict and suspicions between the characters is one of the highlights of this story, especially those of the hunters who, although on a common mission with a common purpose, don’t know each other that well. Steel does a good job of defining the two main characters and their relationship, which is both somewhat co-dependent but also extremely loving and beautiful at times. The character of the renegade vampire de Vallejo and the witch Mama Gale could have been fleshed out more fully in my opinion as a reader. I was certainly left wondering more about these two. Still, this is a solid, readable vampire fantasy, with the promise of more to come in future iterations of this story. What started out as a typical hunt for vampires gone crazy sets Death is for the Living apart as a promising read from the start. JC Steel captivates readers as Cristina Batista and Jean Vignaud work together as a team to uncover the network of spies among the vampires that are hunting them. They become suspicious of the other hunters they are sailing with, plus the rogue vampire they are holding to interrogate. Not knowing whom to trust, they make decisions that would minimize the number of people they work with while maximizing their visibility to the rumored group, Moonstone. Maybe through them they can find answers and avenge Cristina for the nightmares she lived through. However, Cristina and Jean have too many dark secrets that could easily come back to bite them. As a shortish book, you would think Death is for the Living would be a quick novel to read, but I found I hung onto every word for fear of missing an important key to Cristina and Jean’s survival. JC Steel creates such a vivid picture of the events in their travels that I felt my heart racing while they fought off vampires or scurried to escape detection. The layers of suspense woven within this novel as the main characters continually defended each other surprised me, though there was still doubt about whom to trust. This is a well-written story and I would highly recommend it to anyone who enjoys a good vampire mystery. I wanted to be mad at the author for the ending; how could they do this! But it was perfect! It ended the way the whole book was written, with mystique. Death is for the Living by JC Steel was supposed to be my bedside reading for a couple of nights, but in the end I could not put the book down until I finished it. The story centres around Christina Batista and Jean Vignaud, crew-mates on the yacht Artemis, running charter tours for tourists as cover, but hunting vampires as a profession. Soon, they find themselves in the crosshairs of one of the most powerful vampires in the Americas, and are forced into fleeing their hunting grounds. Increasingly suspicious of their fellow hunters and forced into an uneasy alliance with a renegade vampire as well as the shadowy Moonstone organization, they have to accept an insane gamble for their lives. Death is for the Living kept me exited about Christina and Jean's journey. 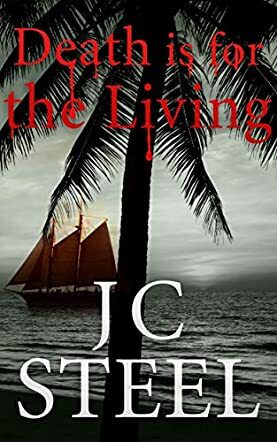 The Caribbean setting works surprisingly well for a vampire novel and the description of the dangerous life onboard the Artemis is one of the highlights for me. The book is well written with a great balance of action, character development and vampire mystery.